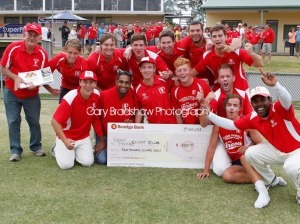 Baden Powell have beaten Red Hill in the final of the 2012/13 peacock cup held on Sunday 3rd Febuary at Mornington. A large crowd gathered on Sunday Feb 3rd at the Mornington Cricket Ground to see the T20 Final of the Jack Peacock Cup played between Red Hill and Baden Powell. Prior to the main game both Clubs Under 15 sides played a T20 with Baden Powell taking out the honours. Red Hill won the toss & elected to bat and after 10 overs were looking very comfortable at 0/60, a number of wickets soon fell though & their momentum slowed down. Red Hill steadied though & eventually finished on 135 which led to great debate as to “What is enough?” The answer did not come till the 38th over of Baden Powells innings when they were needing 17 off 18 deliveries. Baden Powell scored at least 10 runs off that 38th over & then comfortably scored the remaining runs in the 39th over. Man of the match was Anjula Perera who was presented his award by the Umpires Jason Leonard-Scott & Gary Wragg. The $4000 cheque was presented by Greg Hilton representing the Bendigo Bank Community Branch of Mt Martha. Congratulations to Baden Powell as winners of the 2012/13 Jack Peacock Cup and they now go on to represent the MPCA in the Cricket Victoria Kookaburra Statewide T20 Cup next season with the final of that competition played at the MCG.